You will train, connect to new jobs & solve the next challenge for the people in your community. Train for career change, job search, or a new promotion. Boost proposal writing & project management skill sets to raise funds. This page is about an Online e Learning course—100% 0nline. If you would like to learn more about the difference between our Online e Learning courses and our Teacher Led Distance Learning courses—go here. Plus: 59 Word & Excel documents to download that contain field guides—and project templates for you to edit and personalize. Plus: Links to over 300 development documents, handbooks and specialized sites. Proof of concept: My development courses have been taken by people from 153 different countries and 500 organizations who have created projects impacting over 400,000 people. It may feel overwhelming to try launching an impact oriented development project. Where can you turn to for information on design and project management? What practical tools are working today? How do you convey development concepts to a community? Together, through this course, we will explore the full process that will allow you to design a successful development project. The course has been developed so that YOU can design a real, international development project, in real time, and package it in preparation for sharing with a donor. So you won’t just be learning how to do this, you will complete this course with a proposal and ready to seek funding. The goal of this course is to increase the number of people positively impacted by well designed projects. We hope to do this in two ways. One: By leverage. If we can get sound tools and techniques into your hands, you and your NGO will be better prepared to develop impact oriented projects for increasingly greater numbers of people. Two: Encouraging you to engage community members in project design and implementation will increase the likelihood that positive impact will be sustained by communities for the long-term. You will finish the course with a project design based upon community need, sustainability, solutions that use best practices, and sound project management tools such as log frames, budgets and schedules. What the Course Will Provide You. I will provide solutions to the challenges that I’ve seen in the form of documents and handbooks that you can download . You are also free to use all of the templates, examples and handbooks that I’ve developed to get your organization running efficiently, develop donor relationships, get your projects running on track, and improve the lives of your community members. What kind of projects have students worked on? Global warming, the environment, deforestation, indigenous communities, humanitarian aid, poverty, food security, hygiene, hunger, health, gender, education, water—and 270 other types of projects. There are two ways to take this course. You can actually work with a real community in the field and use each of the assignments in a step-by-step progression to develop a real development project on the ground. If that’s the case, and if you were to work between one and two hours a week, and do one assignment per week you could complete this course in approximately 10 to 12weeks. This includes 2 weeks to set up an appointment with a community and conduct a needs assessment. Or—you can develop a virtual project which would speed the process up as you wouldn’t need to make time for meetings with community members. 1. Download Word and Excel documents which you uses templates. You take my example template for each assignment, and simply edit it so that it matches the context of your very own project. I also provide detailed workshop plans for doing things such as leading a participatory needs assessment. 2. Download handbooks and manuals. You can scan the list of handbooks in order to find hands-on information about the subject matter of your project. Each assignment represents one sequential step in developing a project. If you do one assignment a week, you simply download that week’s discussion, that week’s homework instructions, and my example template of the finished assignment in order to complete the assignment. Each assignment builds on the previous one. Much of the work is simple copy and paste from last week’s assignment into this week’s assignment—speeding up the process tremendously. You will receive a Course Completion Certificate when you are all done. 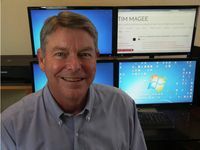 If you’d like to learn more about the course, simply watch the two introductory videos: an introduction to OL 101 and about the courses facilitator—Tim Magee.